Called the “first family of Saskatoon,” the Kusch family is considered to be the first couple with children to settle and make a life in the city. 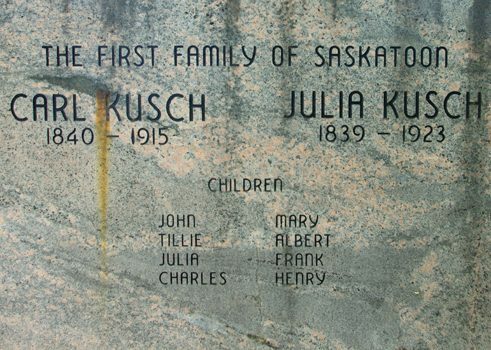 Karl (1840-1915) and Julia (1839-1923) Kusch emigrated from Neustadt, Germany, and despite being both a religious and linguistic minority in the Anglo-Methodist dominated settlement of the Temperance Colony, the family is considered to have made influential contributions to the history of Saskatoon’s agricultural, religious, and social life. The Kusch family arrived in Saskatoon in 1883 along with other settlers of the Temperance Colonization Society. The Kusch family first traveled from Ontario to Moose Jaw by railway and then made the trip from Moose Jaw to Saskatoon by horse-drawn carts. Information presented to the Kusch family by the Temperance Colony showed Saskatoon in an idealized and aspirational form where the city looked like a burgeoning industrial centre, when in reality the city population was mostly bachelors living in tents. For instance, the family was told that there would be a store in the city where they could buy supplies, but when they arrived in Saskatoon there was not even one store, causing Karl Kusch to have to make the 15 day trip back to Moose Jaw to buy supplies. The Kusch family had 8 children and their family continued homesteading for over 100 years. 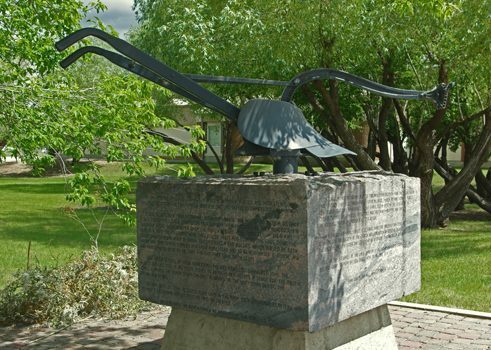 There are several historical points of interest and memorials in Saskatoon associated with the Kusch family. The Kusch family donated land to the St. Paul’s Cathedral which became the first Catholic parish in Saskatoon and was established in 1903. The cornerstone of the church was laid by then Prime Minister Wilfred Laurier at the first mass in 1911. Karl Kusch also donated land for a Catholic portion of the Woodland Cemetery. Kusch family descendants donated land for the Erindale Alliance Church to be built. The Kusch family is honoured at the church with a monument showing a plow uncovered in the shelterbelt, with a description of the significance of the family, the hardships of early homesteaders, as well as a brief mention of the social and political conditions for settlers at the time. A street named after the family, Kusch Crescent, can also be found in Saskatoon in the neighbourhood of Mayfair, while Kusch Park is located in Willowgrove. Recognized by the provincial government for their contributions to farming and agriculture for over one hundred years, the Kusch family was influential in the early developments of Saskatoon and particularly to the minority Catholic community.